Colleen E. Carney, Ph.D., is on faculty in the Department of Psychology at Ryerson University, where she is director of the Sleep and Depression Laboratory. She is a leading expert in psychological treatments for insomnia, particularly in the context of co-occurring mental health issues. Her work has been featured in The New York Times and she has over 100 publications on insomnia. She frequently trains students and mental health providers in CBT for Insomnia at invited workshops throughout North America and at international conferences. 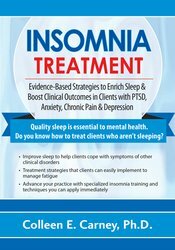 Dr. Carney is a passionate advocate for improving the availability of treatment for those with insomnia and other health problems. For more information, please visit www.drcolleencarney.com. Non-financial: Colleen Carney is a member of the Canadian Psychological Association; and the Association for Behavioural and Cognitive Therapies (ABCT).